Rear Admiral Fagan serves as the U. S. Coast Guard Deputy Commandant for Operations, Policy & Capabilities, where she is responsible for establishing and providing operational strategy, policy, capability and resources to meet national priorities for U. S. Coast Guard missions, programs and services. Rear Admiral Fagan's prior flag officer assignments include service as the First District Commander and the Deputy Director of Operations for Headquarters, United States Northern Command. Additionally, Rear Admiral Fagan is currently recognized as the Coast Guard's first-ever Gold Ancient Trident for being the officer with the longest service record in the Marine Safety Field. In this role, she serves as an advocate and senior advisor for the Service's Prevention workforce. Rear Admiral Fagan's 31-year career has taken her to all seven continents, from the snows of Ross Island, Antarctica to the heart of Africa, from Tokyo to Geneva, and many ports along the way. 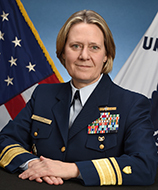 Prior to assignment to NORTHCOM, she served as Commander, Sector New York. Rear Admiral Fagan has extensive interagency as well as intergovernmental experience. She has worked with both the International Maritime Organization and International Labor Organization on flag state and port state issues, including the development of the International Ship and Port Security Code (ISPS), and the Consolidated Maritime Labor Convention.